A method based on decomposition of acceleration field and Lie derivative is introduced to identify shearing and rotational domains. This method is validated on two typical kinds of model flows. Vorticity dynamics of flow around bluff body is studied, illustrated by numerical examples of flow around an elliptic cylinder, a slanted elliptic cylinder and an elliptic cylinder with a pair of bumps on the front side. To explain the generation of vortical structures and how they evolve into inner flow field, boundary vorticity dynamics analysis is performed. Boundary vorticity flux as well as the enstrophy diffusion flux creates vorticity sources and vorticity sinks, which generate or consume boundary vorticity, then shearing layers are generated and interact with each other finally create vortices. 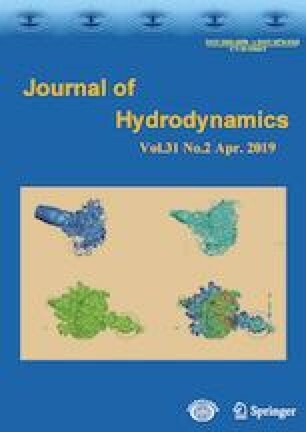 The results provide potential in accurate flow control by boundary deformation, and show that relevant theoretical conclusions can be effectively applied in revealing the flow mechanisms. Project supported by the National Nature Science Foundation of China (Grant Nos. 11472082, 11172069).